Atypical long-acting injectable (LAI) antipsychotics may improve treatment options for patients with serious mental illnesses, such as schizophrenia and bipolar disorder. A systematic review of 1,700 outpatients from 10 different studies reported a 30-percent decrease in the relative risk for relapse with LAIs versus oral antipsychotic medications. However, first-generation depot medications, such as haloperidol decanoate and fluphenazine decanoate, have been associated with considerable injection site pain, which may negatively influence patient attitudes and lead to treatment discontinuation. Second-generation LAIs, such as paliperidone palmitate (PP), risperidone long-acting injection, olanzapine pamoate, and aripiprazole extended-release injectable suspension, are aqueous-based formulations, and injection-site reactions (pain, induration, and subcutaneous nodule formation) have been reported. However, there have been no head-to-head comparisons of injection-site pain associated with first-generation depot antipsychotics versus pain with PP or other atypical LAIs. Therefore, we have completed a hypothesis-generating, descriptive comparison of injection-site pain associated with PP versus first-generation depot antipsychotics. 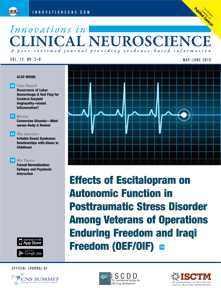 Published data from a study that reported visual analog scale (VAS) measurements of pain associated with several first-generation depot medications have been indirectly compared with VAS pain scores obtained from an open-label, repeated-dose, multicenter, parallel-group Phase I study of PP (NCT00073320 [R092670-USA-3]). [5,a] Patients in both studies rated injection-site pain using the same VAS scale: 0 (no pain) to 100 mm (maximal pain). We selected a Phase I PP study because it was the only trial of PP in which similar data assessing injection site pain two days after administration of PP were matched with the timings of the Bloch et al study3 on the same patient-reported VAS measure. 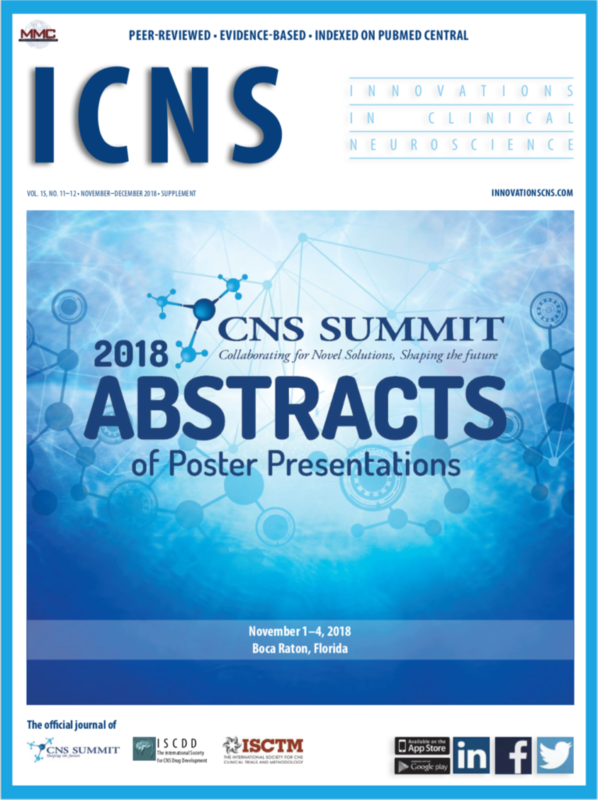 [3,5] The first-generation depot study comprised 34 subjects with schizophrenia or schizoaffective disorder who were treated with depot antipsychotics (haloperidol, fluphenazine, zuclopenthixol, or flupentixol) and had VAS pain measures taken five minutes before injection and five minutes, two days, and 10 days after injection. The PP study enrolled 83 subjects with schizophrenia that were given two injections of 39-mg PP or 234-mg PP into the deltoid or gluteal muscle.5 Pain was assessed using VAS on Day 1, Day 2, and other days over a 64-day observation period. Because participants in the Bloch study3 were administered gluteal injections for up to 10 days only, this analysis was limited to an evaluation of data from gluteal PP injections up to 11 days. No inferential statistical analyses were performed. Indirect comparison of VAS scores is depicted in the Figure. Mean VAS scores for both PP doses were lower than any of the VAS scores for first-generation depot antipsychotics. 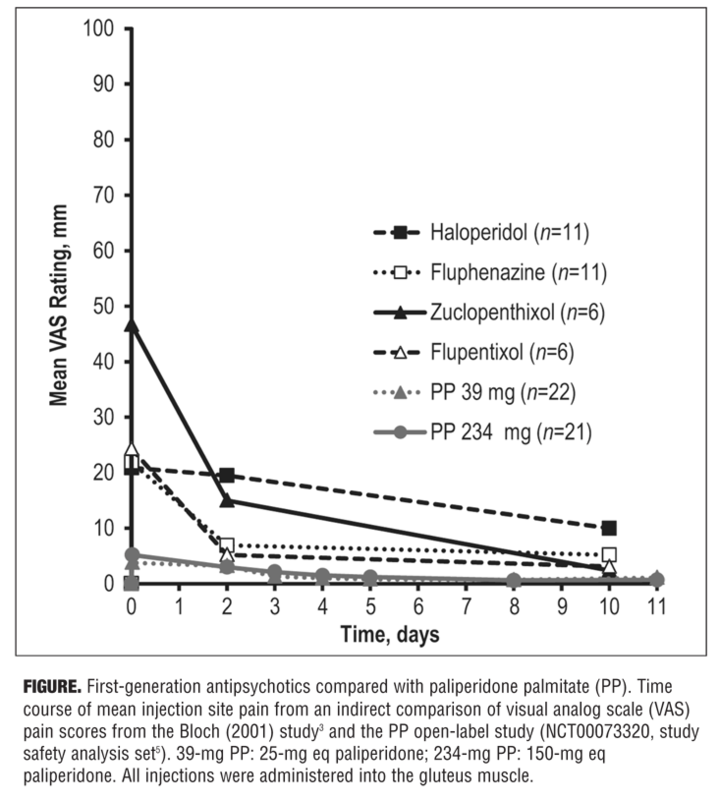 Mean VAS scores obtained two days after injection were 19.5 mm (n=11) for haloperidol, 15.0 mm (n=6) for zuclopenthixol, 6.9 mm (n=11) for fluphenazine, and 5.2 mm (n=6) for flupentixol (standard deviations [SDs] not reported). The corresponding mean Day 2 VAS score (SD) was 3.2 (3.91) mm for PP 39mg (n=21) and 3.0 (3.87) mm for PP 234mg (n=22). The lack of any head-to-head comparisons of injection-site pain associated with first-generation depot antipsychotics versus atypical LAIs makes it difficult to gauge whether the newer LAIs have improved the user experience for patients. Our indirect comparison suggests that PP may be associated with lower mean pain severity than first-generation products. Mean VAS scores for first-generation antipsychotics obtained two days after injection were higher than the corresponding scores for PP: haloperidol, up to 6.5-fold higher; zuclopenthixol, up to five-fold higher; fluphenazine, approximately two-fold higher; and flupentixol, approximately 1.6-fold higher. However, because the comparison is based on different studies conducted at different times, these results should be considered hypothesis-generating only and replicated in a direct head-to-head study. Acknowledgments. The authors thank Alison Comer, PhD, and Matthew Grzywacz, PhD, for providing writing and editorial assistance with this letter to the editor. Author contributions. Srihari Gopal, Teresa Palermo, Jennifer Kern Sliwa, Dong-Jing Fu, and Larry Alphs were responsible for study design, data collection, and writing of the report. Isaac Nuamah was responsible for study design, data collection, writing of the report, and statistical analyses. All authors critically reviewed and revised the report and approved the final version of the report for submission. 1. Alphs L. Novel long-acting and extended-release formulations of antipsychotic drugs. In: Pharmacological Treatments in Schizophrenia. London, UK: Future Medicine Ltd; 2012:50–65. 2. Leucht C, Heres S, Kane JM, et al. Oral versus depot antipsychotic drugs for schizophrenia—a critical systematic review and meta-analysis of randomised long-term trials. Schizophr Res. 2011;127(1–3):83–92. 3. Bloch Y, Mendlovic S, Strupinsky S, et al. Injections of depot antipsychotic medications in patients suffering from schizophrenia: Do they hurt? J Clin Psychiatry. 2001:62(11):855–859. 4. Physicians’ Desk Reference. 69th Ed. Montvale, NJ: PDR Network; 2015. 5. United States Food and Drug Administration. United States Center for Drug Evaluation and Research. Clinical pharmacology and biopharmaceutics review(s). http://www.accessdata.fda.gov/drugsatfda_docs/nda/2009/022264s000clinpharmr.pdf. Accessed February 18, 2014. [a] Methods and results are detailed in a clinical pharmacology and biopharmaceutics review by the United States Center for Drug Evaluation and Research. Gopal and Nuamah are with Janssen Research & Development, LLC, Titusville, New Jersey, United States; Palermo is with Johnson County Mental Health, Shawnee, Kansas, United States; and Sliwa, Fu, and Alphs are with Janssen Scientific Affairs, LLC, Titusville, New Jersey, United States. Funding/financial disclosures. This work was supported by Janssen Scientific Affairs, LLC. Gopal and Nuamah are employees of Janssen Research & Development, LLC, and are Johnson & Johnson stockholders; Palermo is an independent practitioner; and Sliwa, Fu, and Alphs are employees of Janssen Scientific Affairs, LLC, and are Johnson & Johnson stockholders.